Mandaue City—Honda Philippines, Inc. held the third and final leg of the Honda Riders Convention 2018 at the Tent, Mandani Bay, F.E. Zuellig Avenue, Mandaue City, Cebu, where motorcycle riders and enthusiasts gathered for a day of fun-filled activities that celebrated the camaraderie and support of Honda riders to HPI. It is one of the many activities HPI holds under the ONE DREAM campaign, which imparts the accomplishment of the Filipino’s dreams through their products. HPI also boasts the All-New PCX150, which exudes class and style while delivering a premium performance and having an economic fuel consumption of 51.3km/L. This high-end scooter was built to be sophisticated to the smallest details with its advanced features, such as the keyless ignition, Anti-Theft Alarm, and Answer Back System, Full LCD Dashboard, All-LED Lighting equipment with Hazard Lamp, Anti-Lock Braking System (ABS,) ACG Starter and Idling Stop System, and more. Following it is the All-New CLICK150i, powered by a 150cc, Liquid-cooled, PGM-FI engine with Enhanced Smart Power, ACG Starter and Idling Stop System, which gives the bike a fuel economy of 52km/L. Like the All-New CLICK125i, it also has the CBS. For more convenience and added security, the model also brims with advanced features namely the keyless ignition, Anti-Theft Alarm, and Answer Back System. 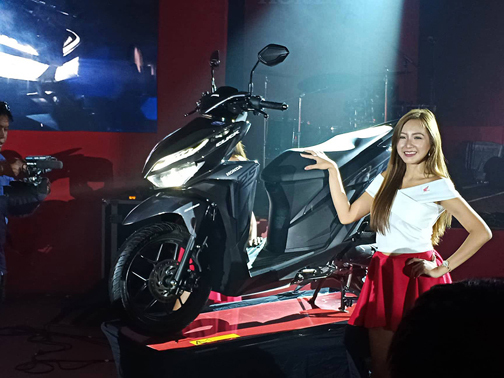 This premium scooter is priced at P95,900.